Located adjacent to Lower Bank Road and 542 is the Green Bank Forest, currently called Swan Bay Wildlife Management area. Back in 20011 manumuskin and myself did a short exploration but have not been back there since. During that time I have been acquiring information on possible property stones and today we went there to see what we could find. It is an historical area as many individuals such as William Sooy, Henry Burr and even the Richard's family has owned property there. Our first main objective was to find a large stone mentioned in an old map I have. 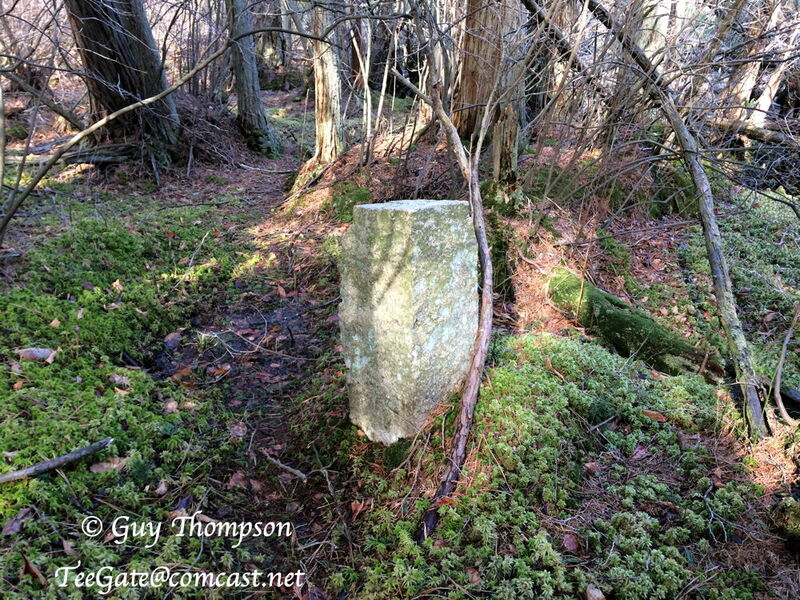 This particular stone was a corner to Henry Burr's 205 acre tract of land and has been there since at least July 27, 1880 as you can see in this map. The stone was shown to surveyor Samuel S. Downs by a John Johnson. I spent quite a bit of time trying to figure out where this was, and as late as a few weeks ago I was unsure. So when we arrived at the location today I had three locations to look for it at. After visiting all three locations we were disappointed. But fortunately, Al is very observant and he discovered this. A few pokes with my walking stick and with a small part of the stone showing, we were able to bring this to you. Frozen in the ground on it's side was the stone mentioned above. 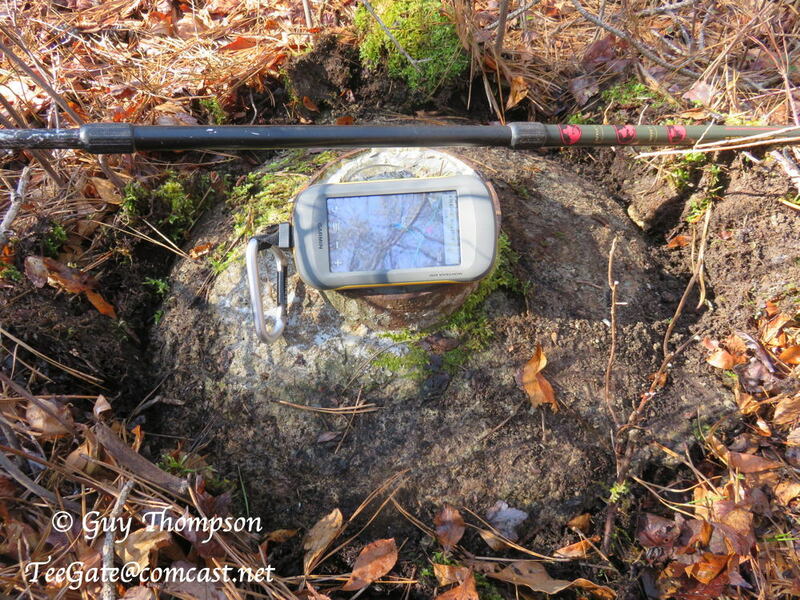 After celebrating our good find we set our sites on a much more remote stone over a thousand feet away. The woods in that area are almost all brier and we were not confident we would even make it there. Working our way through the woods like a snake we did what we thought impossible. 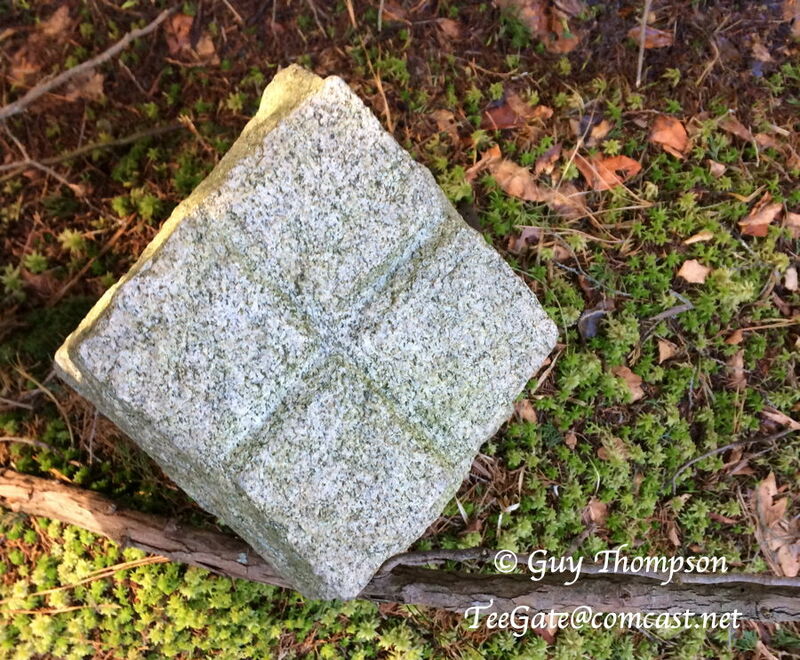 This stone is mentioned on a map I have of William Sooy's "Great Slough Tract." Henry Burr's property ran along it and as the map below says, Samuel S. Downs again surveyed it, this time on June 7, 1867 and he drew this map. This is what he shows on this stone. It was last night before I became semi confident that I had the correct location. It was a long tough walk and I wanted to make sure we were not wasting our time. Upon arriving we circled around forever until I saw this odd looking mound. And after digging it up we had found this property corner from over 150 years ago. There are more to find and we will hopefully be able to do that soon. 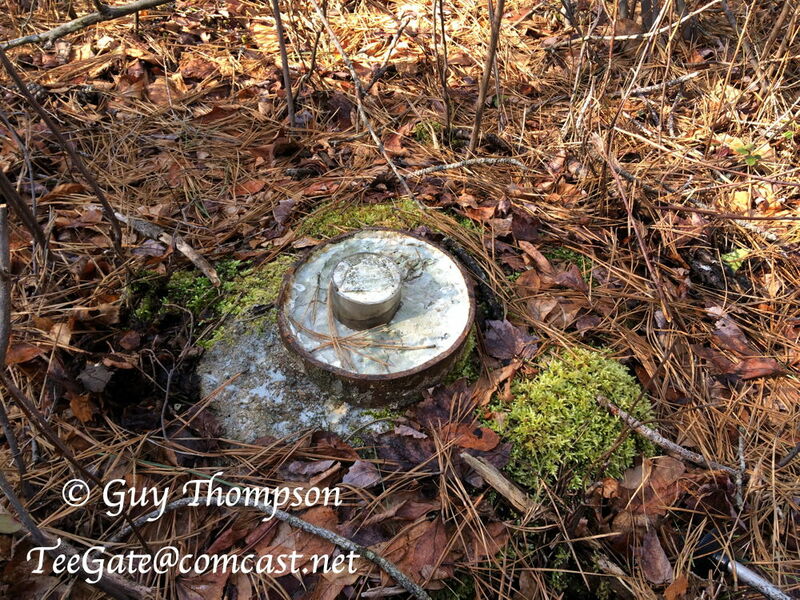 There are even old RR grades in the woods there and logging RR grades as well. Both Al and I remarked today that we can even see them on aerial maps. It should be interesting. Thanks again to manumuskin for pushing me on this project and for asking me to go with him today. It is always a good day when spent with Al. John, bobpbx, turtle and 3 others like this. I had walked within ten feet of that stone you found and missed it but I don't feel too bad since we were close to giving up on that first one when I spotted it from a distance.Yes it was a good day in some bad woods that somehow we managed to snake our way through.Made me think of this song I didn't even get cut up too bad. The RR Grade is next! You 2 amaze me in finding these stones, especially with the snow, moss and leaves. This was nature's best camo. Reading about these finds and pictures I wonder who was tasked with the burden of carrying these rocks to the locations? Some appear quite huge. Maybe they used the traditional "beasts of burden" horses or mules? Guy and I have often discussed how they get these big stones into the middle of nowhere and we have come to the conclusion that often back then it wasn't the middle of nowhere.The woods were probably leveled and there were logging roads to get them close to the corners or they would cut one like surveyors do today and yes they probably hauled them in on a wagon,their version of a flatbed trailer. As far as camo yes many stones are covered in moss and pass for stumps.One i remember was in the middle of an open area that was obviously a dry vernal pond.I knew I was in the immediate area of the stone but could see nothing but open pine needle covered dry pond bottom.I then noticed this moss covered stump sticking up and I walked over and gave it a kick.My rubber boot bounced off so I knew it was solid but it's hard to tell by a kick and I had no metal poker like Guy uses and with that you tell my the sound of the tap if it's rock.So I leaned down and dug my fingers into the moss and felt something very hard so i scratched it with a finger nail and it grated like rock.So I cut an incision with my fingers and slowly pulled the moss cam back of reveal the stone.After photographing I lowered the moss cap back over the stone and smoothed out the cut and the stone was invisible once again. A probe is a very useful thing to have.Guy uses a trekking pole.I have tried carrying flower pot hangers with me but I inevitably leave them stuck in the ground in a swamp somewhere.I"m not used to carrying a walking stick because to me they just get in the way in thick brush but since Guy carries one all the time I think He is used to remembering to retrieve it.Also if you have cold fingers a key will work quite well as a scratcher ot verify if it's rock or not. old jersey girl, Jon Holcombe and 1Jerseydevil like this. Moving on we saw this in the distance. Now we realized where the chairs came from. 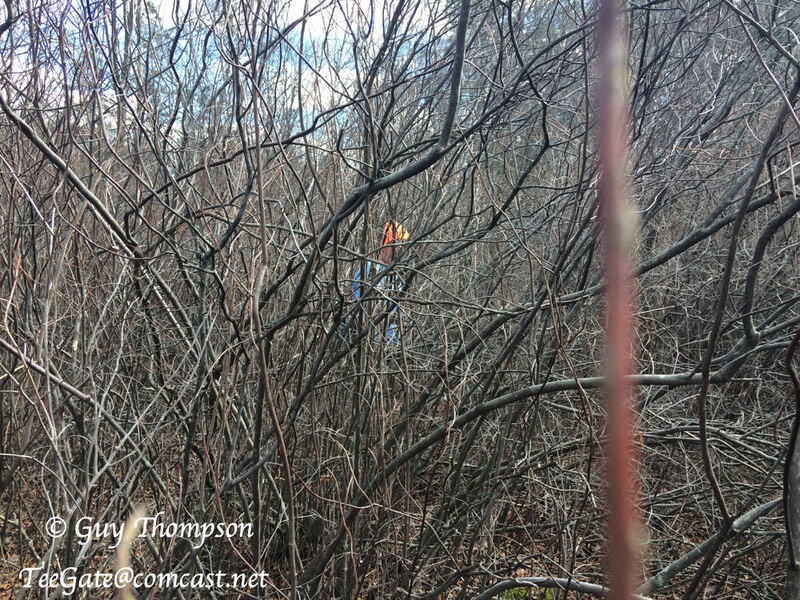 And later we found others randomly deeper in the woods. Arriving where we felt one may be we saw this. It is concrete with metal pipes surrounded by some plastic substance. We had viewed others like this from what I believe to be the survey of the chemical dump property along 532. Basically, semi modern. It was quite large actually. My new GPS getting it's first field test today. Some serious ATV damage at one wetland area back there. It appears they have tried to stop it by placing multiple signs around, but that never works when it is remote like this location. No photos as it was depressing. 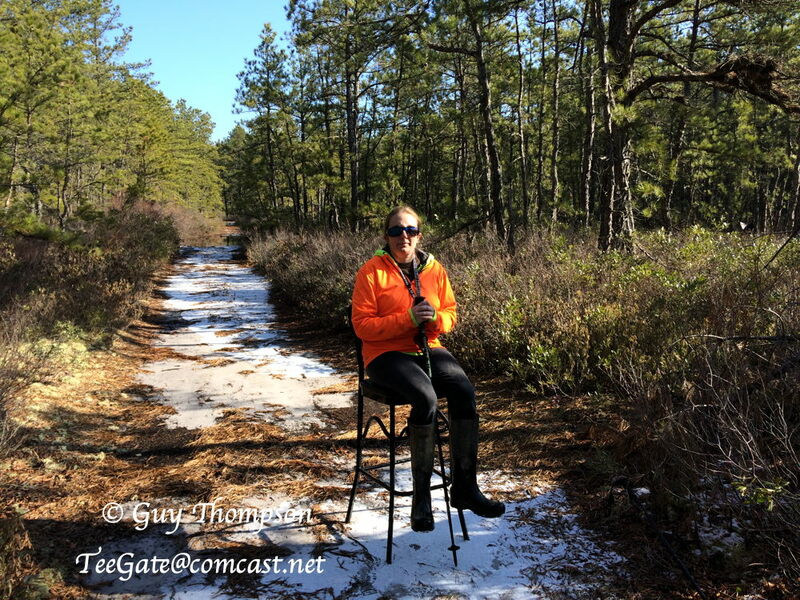 Plus, I went into the water up to my knees and spent my time draining boots. 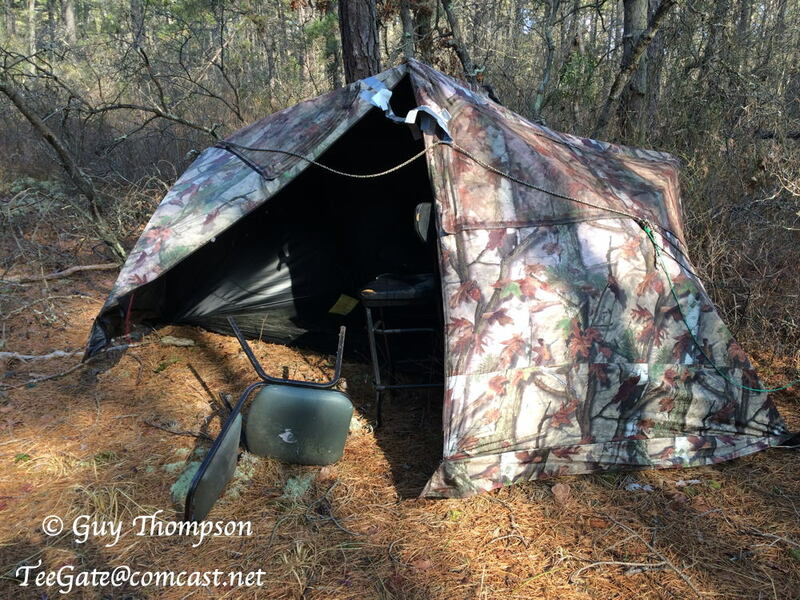 I find at least one tent a year. Always feel odd walking up to them and peering inside. It always sticks in my head that the person who set it up has passed away, and nobody knew of it but him. Same here. We always discuss how long we felt it was there and why it was left. The idea's are pretty wild sometimes. It is an interesting experience walking up to one, we make noise and then open it up to WHAT? Nothing interesting yet, but then you know, people who go deep off the beaten path are weird. people who go deep off the beaten path are weird. We spent the morning today exploring a really tough area of woods while looking for property corners. It took over 2 hours to get to where we wanted to go. On the way back we found a super highway and made it back in just over an hour. Very tough and tiring. Jessica fell once and slammed her shin into a branch and is hurting right now. Jessica took this of me about 20 feet away. This is how it was most of our day. Here is one monument along the way. It is deteriorating quite badly. And our 2 hour walk yielded a pipe. Jon Holcombe, RednekF350, bobpbx and 1 other person like this. 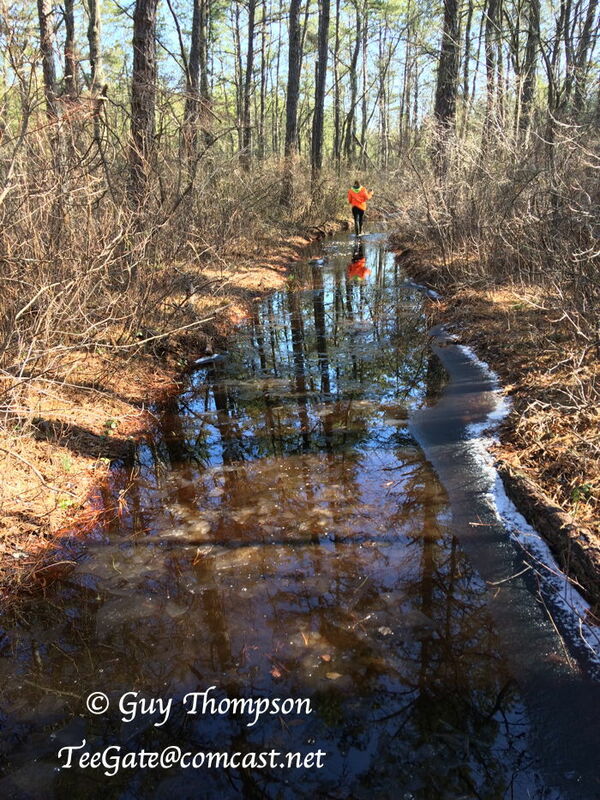 We spent the early morning looking for incised stones in the vicinity of Route 72. We came up empty. 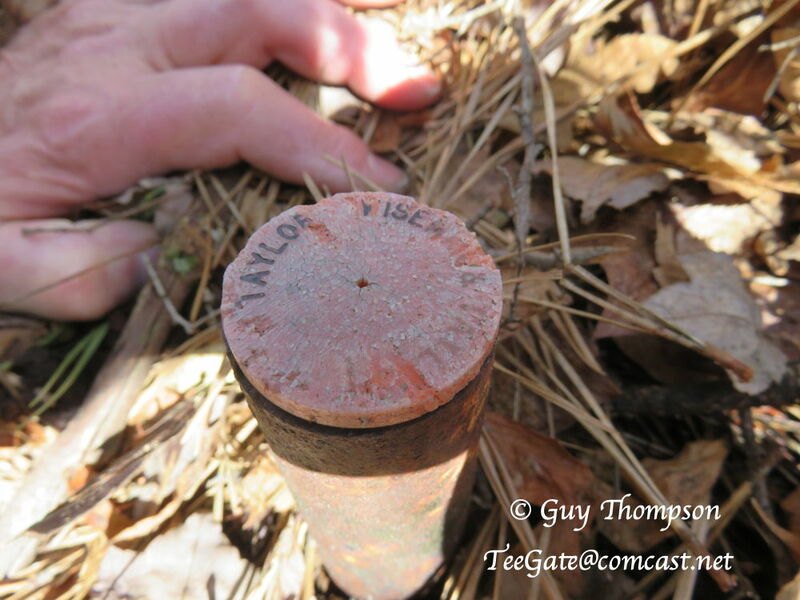 So we moved on to property that was owned by Jonathan Godfrey. He was once owner of the Chatsworth Club and much land around Chatsworth. 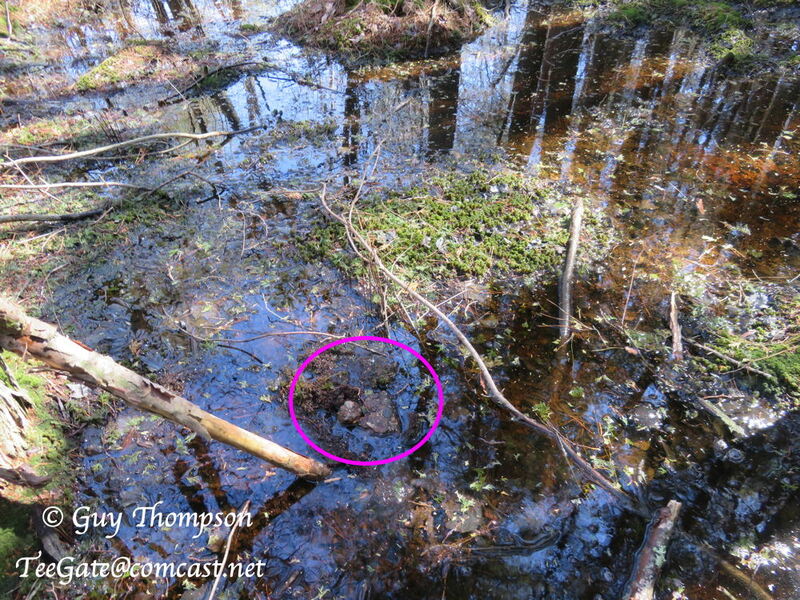 Getting there was fairly easy and a short stab into the woods and we came upon this in a cedar swamp. Jon Holcombe, bobpbx and manumuskin like this. Guy, regarding that book on Chatsworth, wherein Johnathan Grodfrey's photo is shown; isn't it odd that nobody named Haines is mentioned in the industry section of the book? I wonder if it's because their farm operation center is in a different township? I never thought about it before, but it seems odd for the name Haines to not be associated with Chatsworth. It must be the township. The book is on Woodland. The Spring Hill Tract is a massive property consisting of over 3000 acres and is almost entirely in the area burned this past week. 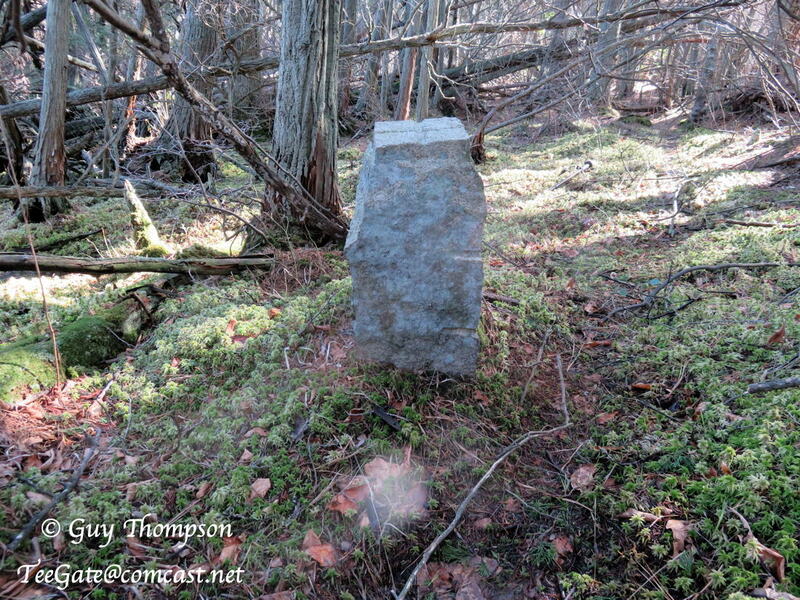 The stones date to at least 1880 and some of them are most likely from the "Mine" survey dating to 1760. We set out this morning to find as many of them as we could that were almost next to impossible to find before the burn. 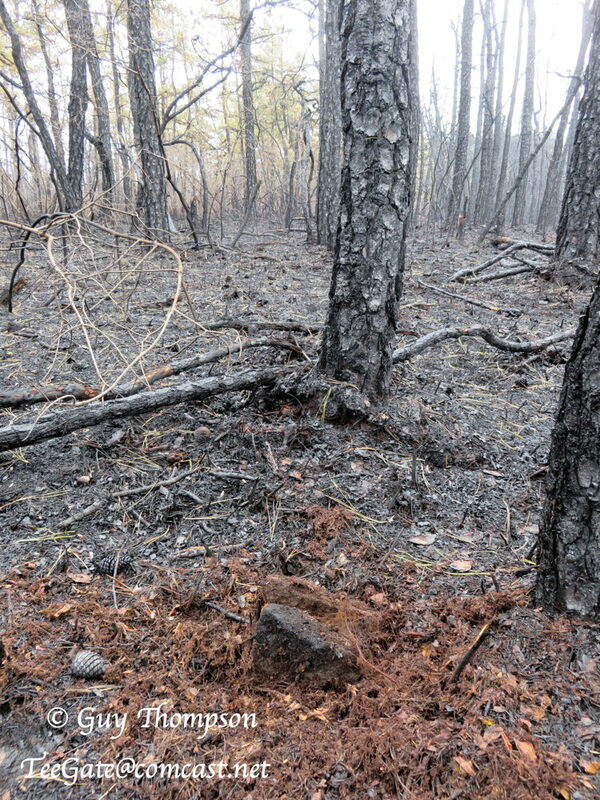 Even today in the burned area we struggled to find some of them. Unfortunately, my camera is failing miserably; however, we were able to get video of a few finds. This was the first one we looked for. This one was a double stone. 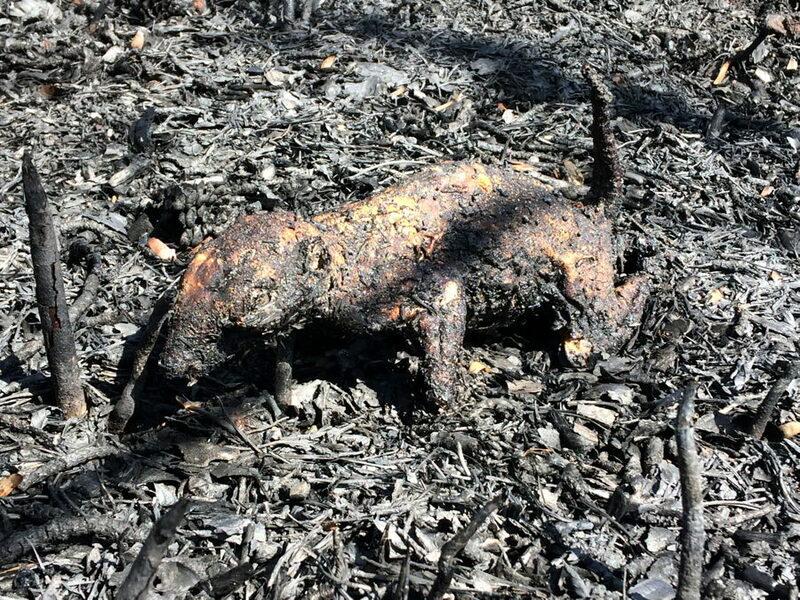 And we found a burned squirrel. Only click the link if you want to see a dead squirrel. In the end we found 6 stones and a seventh with the double stone. Two more to find in the burn area from this particular tract. Jon Holcombe and manumuskin like this. Cool beans Guy. What was your impression of the fire, did it burn real hot? Seems so, at least in some areas. Also, any burnt wet areas? Every area we walked through today was burned in some way. Even wet area's. Here is the sponge at the below link. 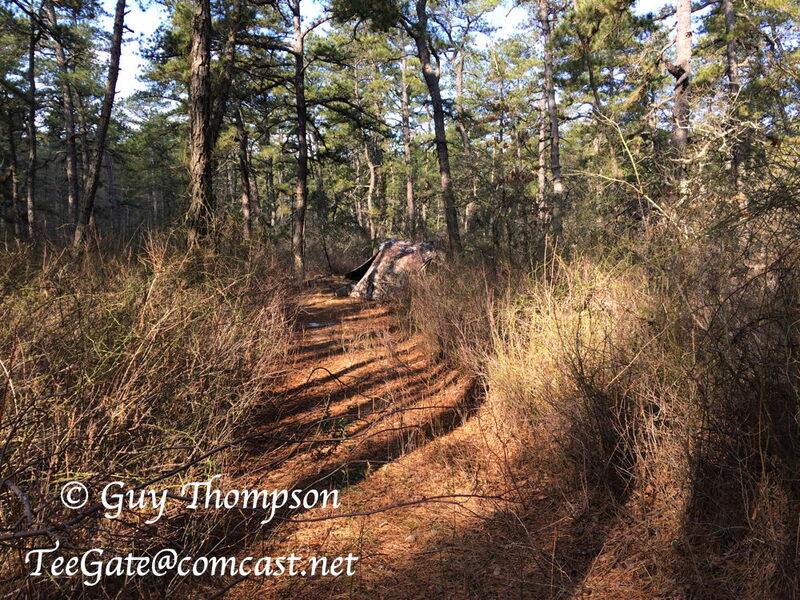 And this area near where Doug was stuck a few years back was nice and crispy. Not as crispy as Warren grove but close. Very quiet and remote to walk around in. I will be going back there. Had you ever looked for these stones before and couldn';t find them? are they from surveys or picking corners from corners off a topo or overlay?